This weeks sacking of Chris Hughton, brings the number of Premier League clubs who have changed manager this season to eight. That’s 40% of teams in the division. The number of managerial departures is even higher, at nine, due to Fulham sacking Martin Jol, then bizarrely firing his replacement Rene Meulensteen after just 17 games in charge. With rumours of Tim Sherwood’s imminent removal at Spurs, and intense pressure on David Moyes at Manchester United, more departures are likely in the summer. The average length of service for current Premier League managers is 1.83 years, if you omit Arsene Wenger it’s as low as 1.00 years. The graph below shows the percentage of Premier League managers who have been in charge longer than x number of years. 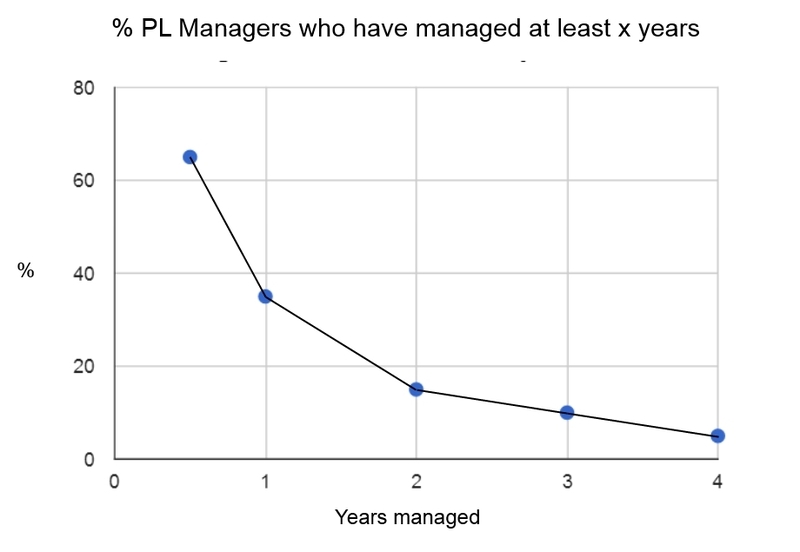 Notice the rapid drop off of managers with longer tenures. Tim Sherwood is incredibly the 15th longest serving manager in the league. Jose Mourinho, who returned to Chelsea in the summer, is 9th. Brendan Rodgers is 4th. Even Moyes is at number 11. As you can see from the graph below, Arsene Wenger is a special case. He has spent more than 17 years in charge of Arsenal. Wenger’s longevity is partly due to his early success which brought him a degree of loyalty from fans, along with consistent top four finishes, guaranteeing Champions League football – vital for modern football’s money men. Even so, his position looks increasingly fragile. So why are clubs so quick to sack the manager? One often posited theory is that the root cause is the recent massive increase in the amount of money in the game. A chairman cannot afford to have an under-performing team. Today, the measurements of success and failure are more pronounced and the margins finer. Finish fourth and you get the jackpot of Champions League football. Finish fifth, even if it’s only on goal difference, and you’re in the less prestigious and far less lucrative Europa League. Relegation provides an even starker contrast. Managers are often victims of their own success. All too often, they’ll win a surprise promotion to the Premier League. Then when the team unsurprisingly struggles, they’ll find themselves out of a job. A coach will take a team higher and higher until they reach the limit of their own or their club’s potential. Then with ever higher expectations they’ll eventually fail. Another modern phenomenon which makes a manager’s life more difficult, is the rise of player power. With massively increased salaries, media profiles and the Bosman law changes, players have a lot more influence than they used to. Often they are on several times the manager’s wage. Controlling these inflated egos cannot be easy. When the coach and the star player have an argument, the chairmen may often feel the player is more valuable. In a globalised world, football is a fast changing sport. Training methods, diets, sports psychologists, tactics – everything’s constantly evolving. It’s easy for a manager to be left behind. Only those able to adapt survive. Probably Alex Ferguson’s biggest talent was his ability to reinvent himself and his team. It’s arguable that Wenger’s early successes were down to tactical and training innovations he brought with him. By this logic, are his recent travails down to the competition catching up? So should managers be given more time? It depends. I certainly don’t agree with the tortuous confusion of cause and effect that dictates: “Ferguson and Wenger were the longest serving managers, they were very successful, therefore giving a manager time leads to success”. The reason these coaches got given time was because they were successful, not the other way round. On the other hand, no manager can change a club and a team immediately. There’s a balance. Each case is individual. As a Spurs fan, I was unhappy when AVB was sacked and thought he deserved more time. He seemed to have a plan, the results weren’t too bad and he had a lot of new players that needed to settle in. A significant number of my fellow supporters took a very different view. Contrastingly I’m happy Sherwood is likely to be leaving, even though it can certainly be argued he’s had even less of an opportunity. The difference is his lack of experience and his lack of a direction. When the team’s not performing, it’s normally too late or too costly to change the players. The men upstairs won’t take the blame. So the manager becomes the obvious scape goat. What do you think of the shockingly short shelf life of a Premier League manager? Please leave your thoughts in the comments section below. This entry was posted in General Thoughts and tagged Arsene Wenger, Chris Hughton, football, Managers, Premier League, soccer, Tim Sherwood on April 10, 2014 by Jon @ AnythingButPenalties.